I do not like dark nails on myself, but the other day I wore a black and white saree and dark nails felt reall apt. 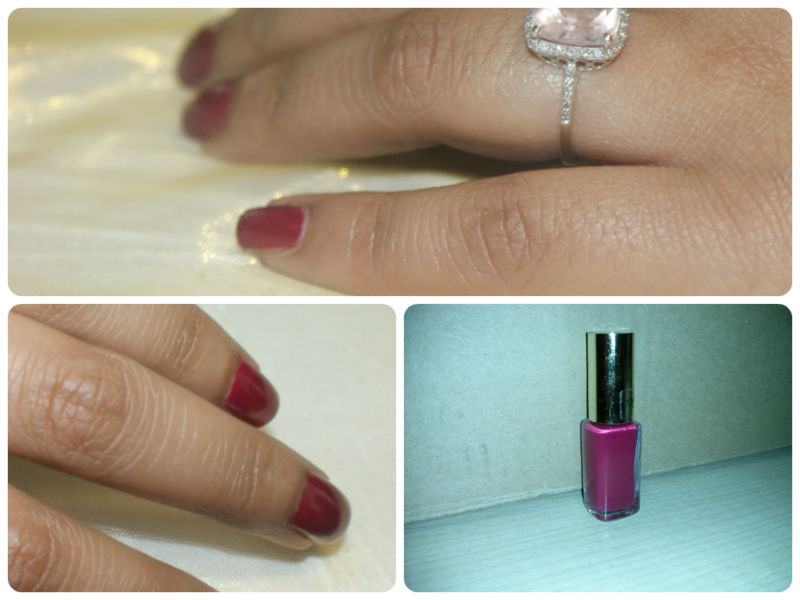 I found L'Oreal Color Riche in Addictive Plum (503) from Nigar's stash. Being last minute as usual I ended up having to paint my nails in a moving car on the way to the event, so excuse the bad painting job (although to be honest I'm just not going to be one of those people who can do perfect manicures on themselves). The flash has made the nail polish bottle appear off colour but the nail swatches are true to life, for better swatches see Claire's post here. The Color Riche polishes are uber glossy and doesn't require a top or base coat. This bottle had gone a bit gloopy which made it difficult to paint with, which is a little disappointing as the bottle appeared pretty full. Otherwise the L'oreal Color Riche's are excellent formulations, dries pretty quick, are super glossy, have a great colour selection and they update with on trend colours regularly. They can be found at ASOS (free worldwide delivery) and the regular places.